Iran has been drawn into the British sphere of influence. Iran is home to farmers and nomads. The powerful kingdom of Elam has emerged in southwest Iran. Indo-European nomads are moving into Iran from the north. Iran, the centre of the great Persian empire. Iran - "the land of a thousand cities". 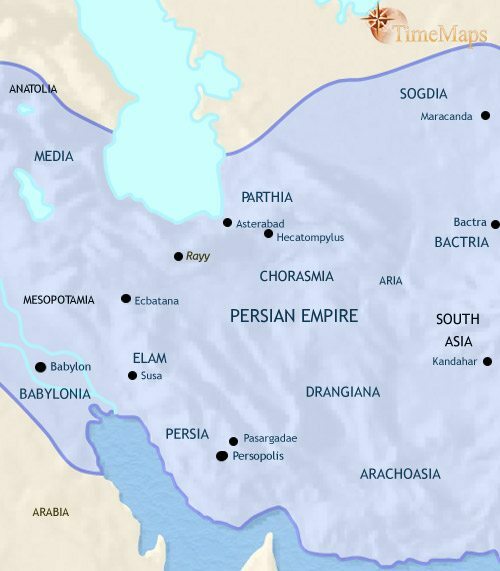 Iran, the centre of the Parthian empire. Iran, the centre of the Persian empire. Iran, a province of the Arab empire and a centre of opposition to the Umayyad caliphate. Iran is falling away from control by the caliph in Baghdad. Iran is now under Turkish rulers. Iran has become a brilliant centre of Islamic civilization. Iran under the Safavids continues to be a brilliant centre of Islamic civilization. The Safavid dynasty is in decline. For Iran, this is a period of economic stagnation and some territorial loss. Iran is effectively now under Russian rule. Iran has become an enormously wealthy country. Iran has become an Islamic Republic. The Shahs of Iran have maintained their country’s political independence but, economically, they have been drawn into the British sphere of influence. Iran’s manufacturing industries have declined in the face of cheap goods from abroad, and her main exports are now crops such as rice, tobacco and opium. Naser al-Din Shah currently occupies the throne. He has tried to solve his financial problems by selling commercial concessions to foreign companies. This has aroused hostility amongst the population and the clergy and, in any case, achieves very little for the country at large: the money raised is squandered by the Shah and his family on expensive trips to Europe. 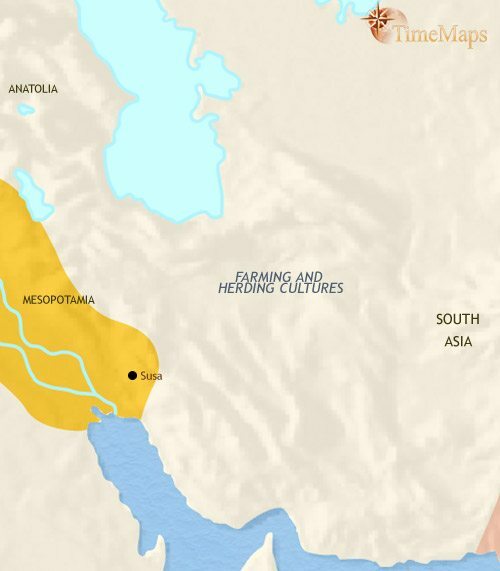 In 2500 BCE Iran is home to farming and herding societies. The rugged landscape of much of Iran means that the population lives in local, small-scale communities. 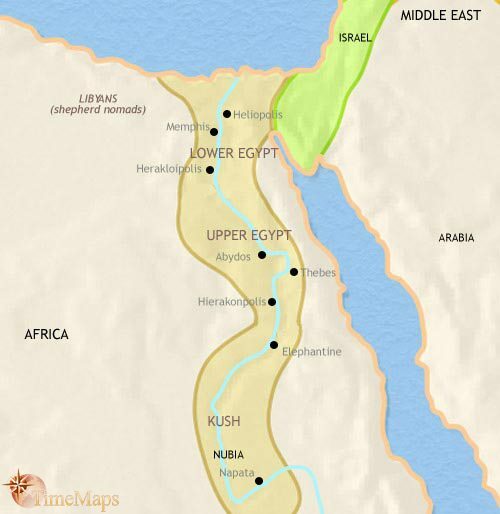 The exception to this is in the south-west corner of the region, which has come under the influence of the Sumerian civilization of Mesopotamia. Here, the kingdom of Elam is emerging, with its chief city at Susa. The past 1000 years have seen great changes come to the people of this region. In the south-west a powerful kingdom has emerged, that of Elam. This has adopted the art, architecture and writing systems of Mesopotamia, and plays a prominent role in the wars between Mesopotamian kingdoms. At times the kingdom has come under the rule of Mesopotamian states, such as the Akkadian empire, and the city of Ur; at other times it has itself exercised power within Mesopotamia. Susa, its capitals, is one of the great cities of the Middle East. The inhabitants of the central plateau of Iran have been hardly affected by these developments, and continue to live in small-scale village communities. 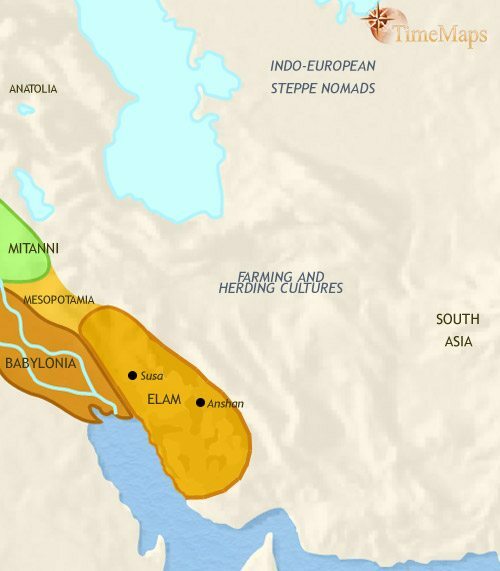 To the north, Indo-European peoples from the steppes have settled. One branch of them is moving through mountain passes into India, where they will form the Aryan peoples. 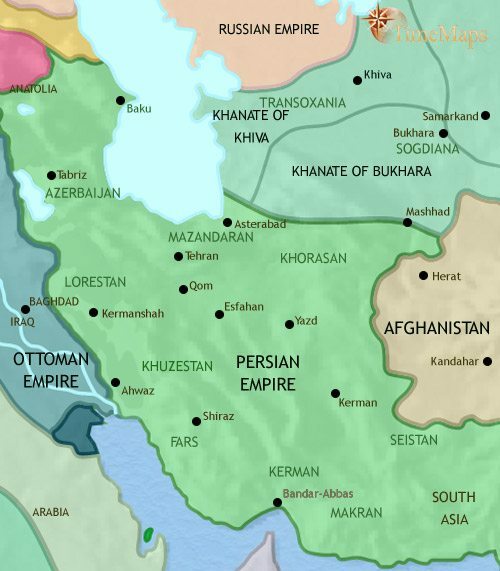 In the north and north-west of Iran, nomadic groups from the western steppes of central Asia, speaking an Indo-European language ancestral to modern Iran, have been moving into the region, and by now probably dominate the western mountains and central plateau. The leading group of these newcomers is a tribe called the Medes, who will soon be a thorn in the side of the Assyrians, to the west. Another group will be known to history as the Persians, who at this time are probably pressing southward towards Elamite territory. Here, the previously powerful kingdom of Elam has suffered eclipse, and may well have broken up into several small principalities. 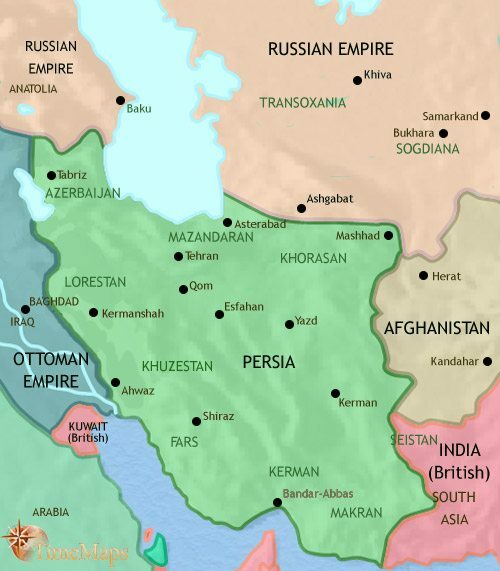 During the past few centuries Indo-European groups have continued to spread over Iran. 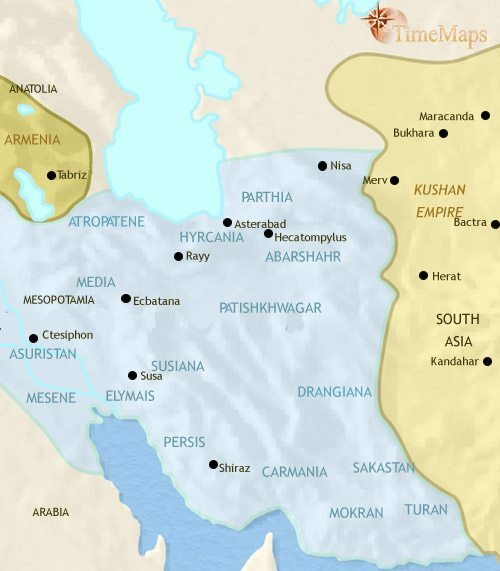 A tribe called the Medes won a predominate position amongst them, and in the 7th century played an important part in the defeat of the great Assyrian empire and then built a vast empire stretching into Asia Minor. In the meantime, another group, the Persians, headed south and eventually moved into the south-western corner of the region. 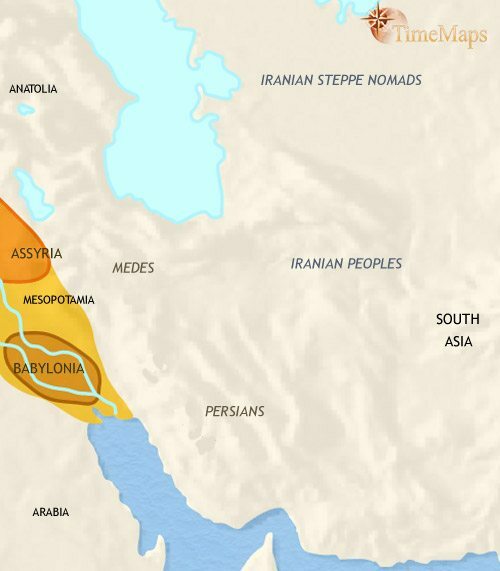 The kings of the Persians became the vassals of the king of the Medes until Cyrus II (ruled c. 560-530) threw off his allegiance and very swiftly took over the entire Median empire. Cyrus then went on to extend the Persian empire, conquering the Babylonian empire and pushing out his borders north into central Asia and east into India. Iran is now the centre of the greatest empire the world has yet seen. While Iran has been taking centre stage internationally, at home it has been experiencing an urban revolution, with many new cities springing up around the country. This has been partly due to the new wealth flowing into the country as a result of the conquests; but it is also due to the rise, further east, of the Aryan civilization of India. 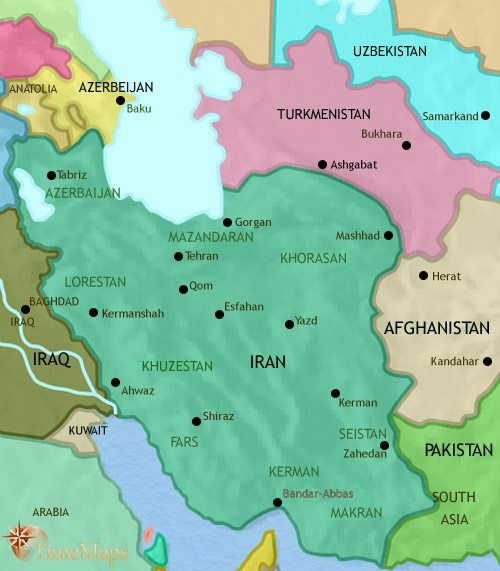 Iran is no longer at the margins of the civilized world, but at its centre, with tribute flowing into it from distant regions and commerce running through it and connecting east with west. This fact is emphasised by the rise of a new monotheistic religion, Zoroastrianism, which it is difficult to see happening without external influences from either east or west. Iran, like the rest of the Middle East, was conquered by Alexander the Great in the 320’s. He founded new cities built in the Greek style and populated by Greeks. Alexander’s successors, the Seleucid kings, have followed this example, and have governed using Greek-speaking officials drawn from these cities. Nevertheless, the influence of Greek culture is only skin deep in the country at large, and the Seleucids’ pro-Greek policy has alienated the native landowning nobility. The focus of the Seleucid kings is on their struggles with their western neighbours in the Mediterranean. This has allowed independent kingdoms to emerge in the east. Along the northern borders of the country, steppe nomads pose a continuing threat, and one group, an Iranian tribe called the Parthians, have established themselves in a separate state since about 250 BCE. Another state appeared at the same time when a Greek general, Diodotus, declared his independence from the Seleucids and founded the kingdom of Bactria. Bactria is an important loss to the Seleucids as it is a rich and fertile land, described as “the land of a thousand cities”. 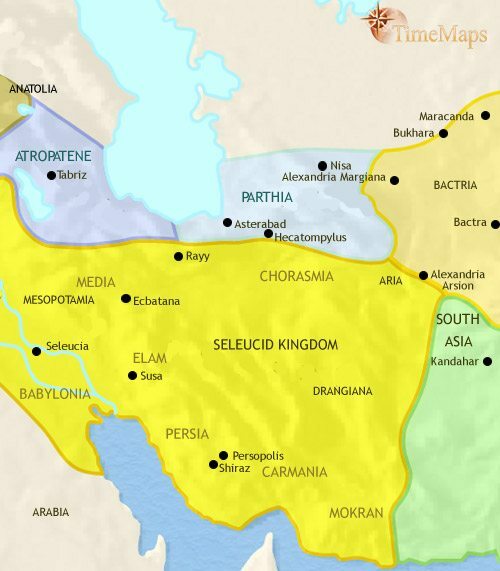 The Parthians, a nomadic tribe who took over a kingdom in northern Iran in around 250 BCE, successfully conquered all the provinces previously ruled by the Seleucids east of Syria. Iran is again the centre of a large empire. The Parthians were aided in this by their pro-Greek policies, and the Greek-speaking cities continue to be centres of Hellenistic civilization. Along the northern borders, steppe nomads have continued to pose a threat, and more than one Parthian king has been killed in action against them. On the whole, the Parthians are successful in defending their territories, however. They themselves have their roots in the nomadic lifestyle of the steppes, and they have developed the first heavy armed cavalry force in world history, which is more than a match for horsemen of the central Asia. 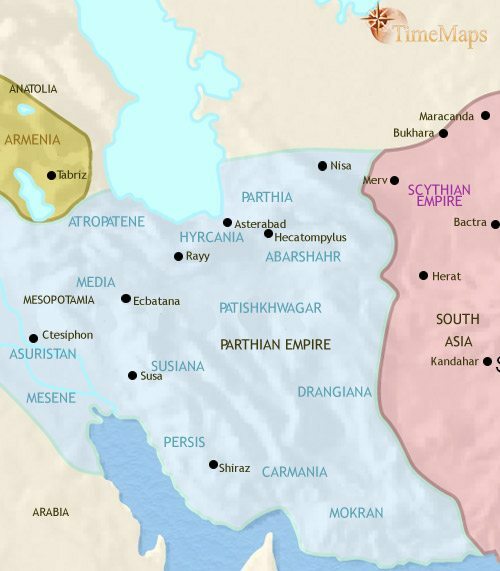 Perhaps as a result, nomadic invasions have been deflected east, towards India, where the Indo-Greek kingdom of Bactria has fallen to the Scythians. This cavalry force – which, incidentally, enabled the Parthians to inflict one of the worst defeats on Rome in its entire history, at the battle of Carrhae (53 BCE) – is under the control of the Iranian nobility, and this, together with their wealth and the hold they have over the countryside, gives them immense influence at the Parthian court. Unfortunately their factional struggles have a tendency to undermine the stability of the Parthian government. The past two centuries have seen the Greek culture of the cities – always confined to a narrow social group – come under increasing stress as the ruling classes of the Parthian empire have sponsored a revival of native Iranian culture. The influence of the powerful Parthian nobility can also be seen the instability at court, with leading noble families competing for control over weak kings. This instability has severely weakened the authority of the Parthian regime, to the point where the empire is now in terminal decline. Within a few years the Parthian dynasty will be replaced by a new regime, springing from amongst the Iranian nobility. Like the rest of the Parthian empire, Iran passed into the rule of a Persian dynasty, the Sasanids, in 224 CE. This regime imposed a much more centralized government structure on its empire than the Parthians had managed. The leading Iranian noble families have retained their influence, albeit in reduced form. The ruling class – royal family, court, Iranian nobles and bureaucracy – hold to the Zoroastrian faith, which is the official religion of the empire. The bulk of the population was probably Christian until the 4th century. From that time, when Christianity became the official religion of Rome, the Sasanids’ great enemy, this faith has been severely persecuted. It nevertheless retains the loyalty of many of the empire’s inhabitants. Manichaeism was also a popular religion, but it has been persecuted out of existence in Iran. Large Jewish communities thrive in many Iranian cities. Culturally, the Sasanid period has seen a renaissance of Iranian art and architecture. This echoes the great days of the Persian empire of Cyrus and Darius, but incorporates Hellenistic elements as well. 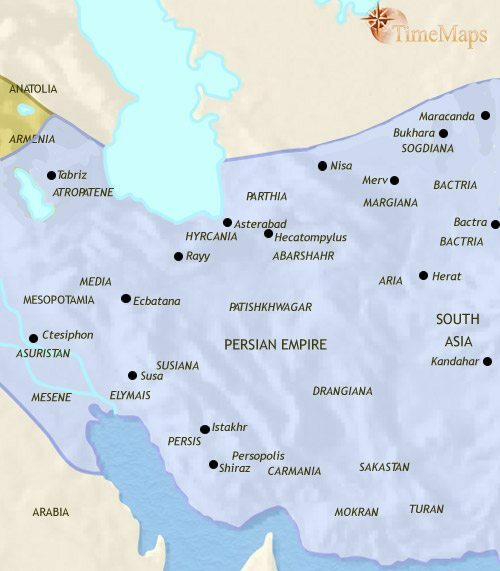 Iran was the centre of the huge Sasanian empire until it was attacked by Arab forces in the 630s. By the end of the 640s almost all Iran was in Arab hands. The last Sasanian emperor was murdered as he fled Muslim forces in northern Iran, in 653. Arab settlers arrived in some numbers, but, rather than forming a separate military elite, as elsewhere, they became a peasantry, soon merging with the native people. The Umayyad regime, which ruled the Islamic Caliphate after 661, was based in distant Syria, and saw Iran merely as a source of taxation. It did not maintain the irrigation system properly, and farmland was lost to the encroaching wasteland. The Umayyads also failed to maintain peace within Iran. The condition of the bulk of the peasants, as well as of the merchants, deteriorated. The Shi’ite sect became the rallying point for discontent against the Umayyad regime amongst Muslims, and was particularly strong in the eastern provinces of the Caliphate. In 747, it mixed with resentment caused by high taxation and Umayyad oppression in northern Iran to flare into open revolt under a leader known as Abu Muslim. This rebellion soon gathered popular support and its forces overwhelmed the Umayyad army sent against it. The Umayyad regime came to a violent end and the new ‘Abbasid line of caliphs was established. 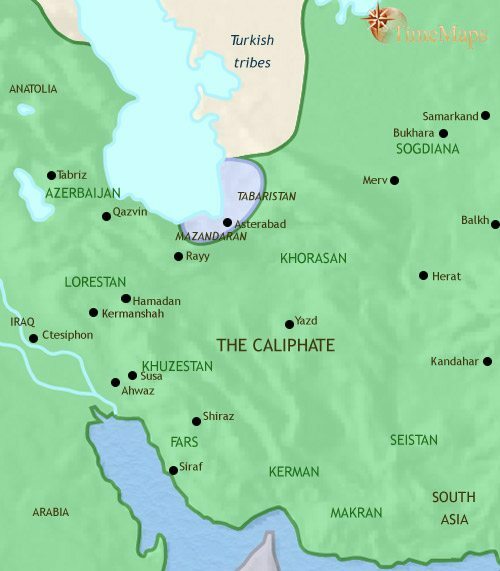 With the replacement of the Umayyad caliphs, based in Syria, by the ‘Abbasids; and with the building of a glorious new capital at Baghdad in Iraq, power in the Caliphate shifted decisively eastward. In the early 9th century, however, the eastern provinces of the Caliphate drifted out of Baghdad’s control. Powerful hereditary governors, the Tahirids, ruled eastern Iran as virtually independent princes from 821, and then in 873 a rebel commander seized a large part of Iran and established the Safarid state. At about the same time, an emir established Saminid rule in Transoxania. 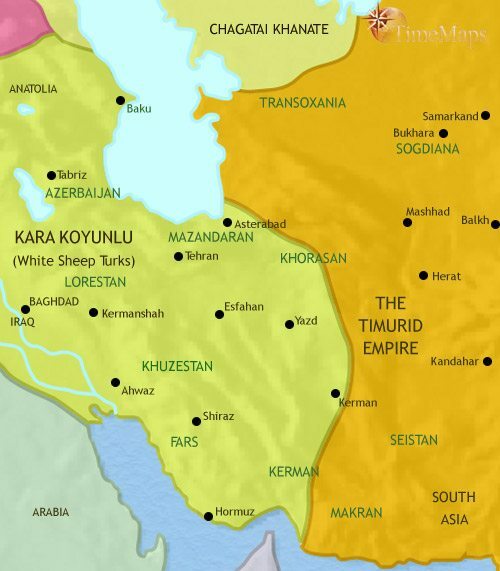 In 898 the Saminids conquered the Safarids, so controlling a huge area of Iran and Transoxania in virtual independence. The Saminid capital, Bukhara, now rivals Baghdad as a centre of Islamic culture, and attracts leading scholars. In particular, this period sees the merging of Arabic and Persian art and literature into a brilliant new cultural mix expressed in the New Persian tongue as well as in Arabic. 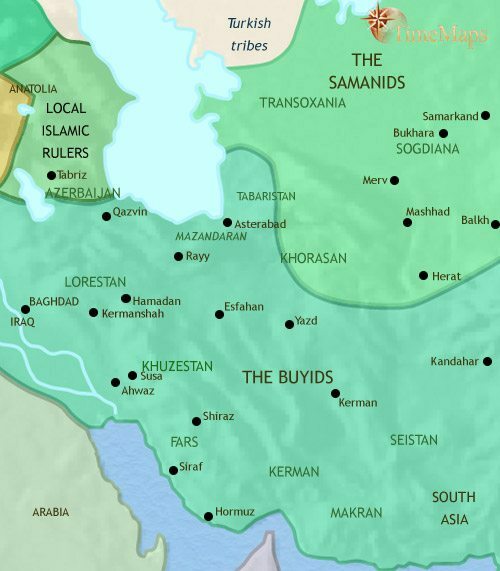 In the 930’s, a group in north-western Iran called the Buyids expanded outwards and formed a large empire (though still formally acknowledging the caliph as their overlord). Like the Saminids, the Buyids have turned their capital, Shiraz, into one of the great centres of Islamic culture. Saminid rule of northern Iran came to an end in 992, to be replaced by short-lived Turkish dynasties. The most famous of these was founded by Mahmud of Ghazna, who established a brilliant court which became a major centre for the dissemination of Islamic religion and Persian culture into India. From the 1040’s Iran, along with much of the rest of the Middle East, came under the control of the Seljuq Turks. Their rule lasted until the capture of the Seljuq sultan by Turkish tribesmen from central Asia in 1153, after which the different areas of Iran quickly fragmented into rival principalities. 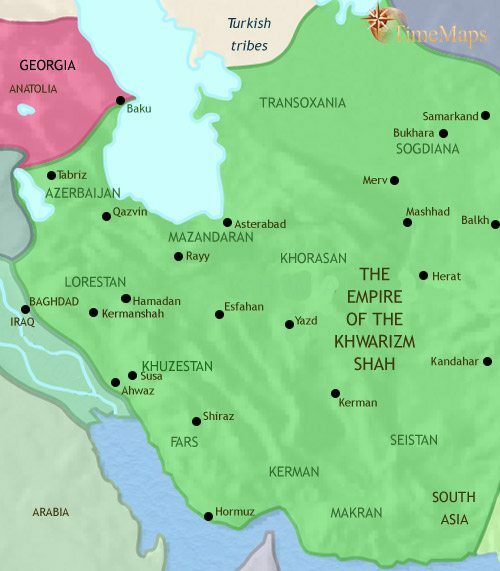 One of these, the Kwarezm-Shah, took control of the Oxus region. 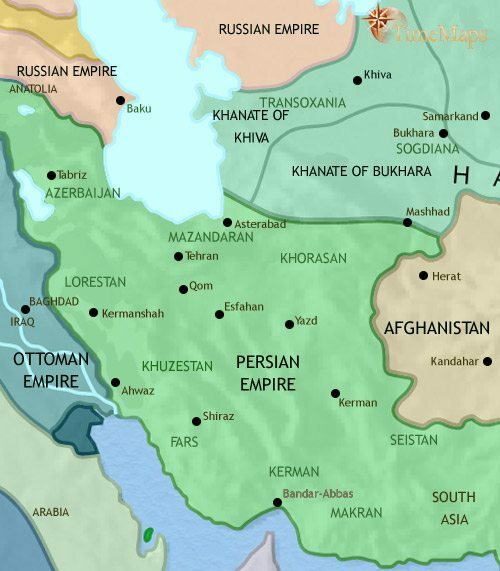 He accepted vassal status to the Karakitai emperor in central Asia, in order to free himself up for conquests elsewhere; since then, he has subdued the whole of Iran and surrounding areas. His armies, recruited in central Asia and led by particularly brutal commanders, bring fear and loathing wherever they appear. The empire of the Kwarezm-Shah fell to the Mongols under Genghis Khan in the 1220’s and 30’s. During the Mongol conquests, Bukhara, Samarkand and other once-thriving cities of the Transoxus region were razed to the ground and their populations massacred. They were soon rebuilt and gradually regained their former size and prosperity, thanks largely to the peace which Mongol rule brought to inner Asia, with the resulting expansion in trade. Iran was treated as a conquered province by the Mongols, and placed under very heavy taxation. The situation deteriorated further after 1335, when regional rivalries and civil war disrupted the land. Then in the last decades of the fourteenth century another invader from central Asia, Timur, conquered Iran and beyond. Timur’s huge empire quickly disintegrated after his death, but his descendants have held on to eastern Iran. The long reign of Timur’s son, Shah Rokh (1405-47), has seen Herat, his beautiful capital, become a brilliant centre of Persian Islamic civilization. 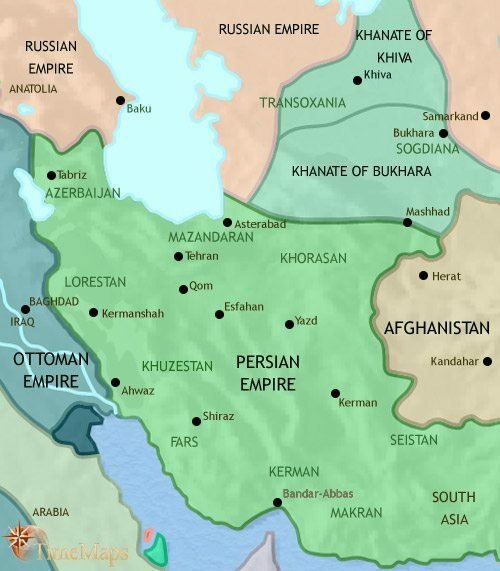 Iran was conquered by a group from central Asia called the White Sheep Turks in the years after 1467, but then fell to a Shi’ite movement called the Safavids. 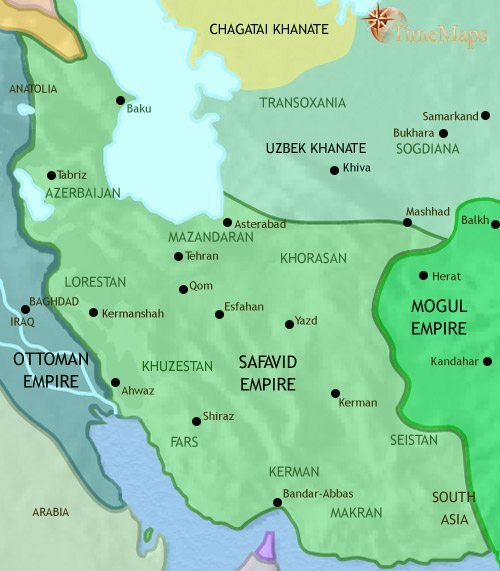 Under their leader Isma’il (1501-24), they seized Azerbaijan and then swept into Iran, conquering the whole country within the space of a few years. The Savafid shahs consolidated their rule by clamping down on their more extreme followers and establishing themselves as an effective government. Under their rule, Iran has enjoyed a period of political stability and economic prosperity. Shah ‘Abbas I (1588-1629) and his successors have built up a strong standing army of slave soldiers, trained and equipped on European lines; they have organized an efficient bureaucracy and have encouraged agriculture, industry and commerce. This period is one of major cultural achievements in literature, art and above all architecture. The Shi-ite clergy in Iran have been growing in power for some time now. Up until this period, Shi’ite religious leaders have shunned public office, regarding it as incompatible with the religious life. However, under the Safavids, the clergy have increasingly become involved in government as judges, administrators and courtiers. They have used this power to strengthen their hold on the population, at the expense of Sufis and extremists. A Safavid governor in Afghanistan, called Mahmud, rebelled, marched on Esfahan, the Safavid capital, and murdered the Safavid Shah (1722). He was quickly driven out by a Safavid general, Nadr, who then became the real power in the land. After several more military successes, Nadr was proclaimed Shah (1736). A little while later he conducted his famous raid on India, seizing the treasury of the Mughal emperor in Delhi. Later still, he seems to have become mentally unstable, and was murdered (1747). After his death, Iran slid quickly into chaos. This was partially brought to an end by the triumph of Karim Khan (1750-79), who ruled in the name of the powerless Safavid shah and who brought a measure of stability to the country but, after his death, chaos has again reigned. The chaos which followed the death of Karim Khan was ended when the cruel Agha Muhammad Khan triumphed over his rivals and became shah (1796). His son, Fath ‘Ali Shah succeeded him the following year, and has reigned ever since, presiding over a period of economic stagnation and some territorial loss. The last decades of the 19th century saw a further growth in European – especially British – influence; this trend has been strengthened by the discovery of oil in 1901. This influence has brought economic expansion, but it has also brought increasing criticism. The local merchant community were concerned with the privileged commercial position held by foreigners, which threatened their own livelihoods; and their traditional allies, the Shi’ite clergy, were anxious about the challenges westernisation posed to an Islamic society and culture. With the grass roots support the clergy could count on, and the mass protests they could summon up, no government could ignore this opposition for long, especially when the currents of global trade brought inflation and economic hardship for some segments of society in their wake, as they did in the 1870’s and 80’s. In 1906, therefore, the government set up a constituent assembly, the Majlis; this was suppressed in 1908, because of the criticisms it voiced of the government, but was restored again the year after. When, however, the assembly passed laws which infringed Russian and British commercial privileges, however, Russian troops intervened. For the past few years Russia has effectively ruled Persia. At the outbreak of World War 1, Iran soon became the scene of fighting between the Russians and British against Turks and Germans. The end of the war saw Britain as the sole European power in Iran. In 1921 an army officer, Reza Khan, staged a coup. He established a dictatorship, and had himself enthroned as Shah in 1925. Under his rule Persia rapidly modernized in all fields – education and the judiciary were secularised, rights for women were introduced; and to emphasise the modernity of the country, its name was changed to Iran in 1935. 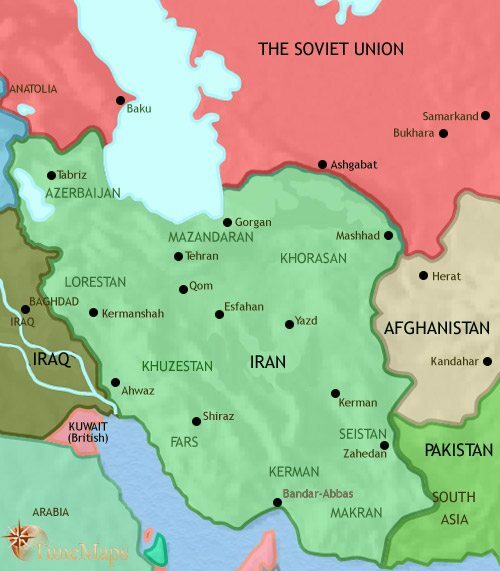 In the later 1930’s Reza Khan leaned increasingly towards Nazi Germany, to counter the dominant influence of the British and the USSR; during World War 2, therefore, Iran was occupied by British and Soviet forces to ensure safe passage of US aid to the USSR. Reza Khan was forced to abdicate in favour of his young son, Mohammed Reza, in 1941. In 1951 the prime minister, Mohammed Mosaddeq, nationalised all foreign (mainly British) interests in the oil industry. The British then imposed an economic blockade which caused serious economic dislocation. Mossadeq and the Shah became increasingly estranged, and this situation came to a head when the Shah fled the country. Mossadeq was then ousted by a CIA coup, and the Shah returned. A new agreement over oil was signed in 1954, after which oil production expanded dramatically. The Shah moved to establish his personal control over Iranian politics, and he adopted a pro-western foreign policy. Internally he imposed a police state on the country, using modern methods with CIA aid. The Shah’s government carried through an ambitious programme of economic and social reform in the late 1950’s and the 1960’s, including land redistribution and the establishment of literacy and health corps. Per capita income rose dramatically in this period as industry expanded. These policies aroused the hostility of influential elements within Iranian society, including the Shi’ite clergy. With the massive increases in oil prices after 1974, Iran’s economy boomed. However, people became increasingly restive under the police state. In 1978 there was an outpouring of anger against the Shah. Events moved quickly to the Islamic Revolution (1979), which saw the removal of the Shah and, under Ayatollah Khomeini, the installation of the Shi’ite clergy as the ultimate controllers of the country. A long-standing border dispute with Iraq led to the long and bloody Iran-Iraq war (1980-88), which ended in victory for neither side. Under the revolutionary leadership, repression was soon as brutal as under Shah, though more or less free elections were allowed. These revolved around a tussle between conservative and reformist politicians. In 2005, the conservative Mahmoud Ahmadinejad was elected president. Asia Minor has fallen under the power of Rome.